For women who want to launch the life of their dreams. When one teacup designer, falls for another teacup designer, a beautiful friendship is born. Daniella was lucky enough to sit down and have some REAL talk with Sydonie from The Quirky Cup Collective. They spoke about the importance of passion, self love and how your success is your own, so own it! Q: You are one super creative gal, tell us about the journey that lead you to developing your vibrant teacup brand, The Quirky Cup Collective? A:Oh wow, that seems like a lifetime ago now! Prior to TQCC, I was working with my mum in her fashion boutique. It was so much fun and I was SO SO lucky to have had that experience in a small business where I had freedom to self teach as well as learn from Mum. As for the arty stuff, I’ve always been creative and have dabbled in everything from sewing, digital art and photography. It wasn’t until TQCC that I actually stuck to one hobby for longer than a month. Q: You also have a strong ‘girl power’ vibe around you, why do you think it is important for women to pursue their passions? A: To me, I think passion is what keeps the fire lit within our souls. Being passionate about something means you almost have this spark lit inside of you and what you tend to pursue with that passion is done straight from the heart. I think this is especially important for people in general because it’s an act of self love. Whatever your passion is, no matter how great or small, investing that time in your interests is a way of connecting with yourself and dedicating time to self development - which is so damn important. Q: What do you do to stay motivated and productive within your business? A: Oh man. I don’t even know haha. It can be a bit of a struggle sometimes - like at the moment I’m just coming out of holiday mode and I am finding it very very rough to get back into it. When it comes to me and my business, motivation and productivity can be inspired by many things. It can be a lovely message from a customer, it can be a sudden spark of creative inspiration, it could be a looming deadline or it could just be the weather, who knows! But ultimately, I constantly have to remind myself that my success is my own and that if I don’t put the work into it then I ain’t going to get anywhere haha. Q: Your instagram feed is a beautiful explosion of colour and you often give story snippets of your day to day experiences. Can you describe what your typical ‘working’ week looks like behind the scenes?. A: I don’t even know how to describe this haha! It’s pretty inconsistent because every week there is something different going on. And it’s in no way as rosey (hehe flower pun), as I tend to show on instagram. It’s a lot of time spent behind a computer doing those boring small business tasks. It’s looking for endless pools of inspiration, whether that be with my graphic design, art, captions or photography. It’s copious amounts of tea drinking and tending to distract myself with things like food, flowers and the trap of scrolling through social media. Overall, it’s pretty imperfect and inconsistent. Even thinking about it makes me wonder whether I’m doing enough. I just try to get through everything one day at a time and remember that I am only one person doing the best I can. Q: What does ‘me time’ look like for you and why do you think it’s important? A: At the moment, I am absolutely loving getting lost in my books. 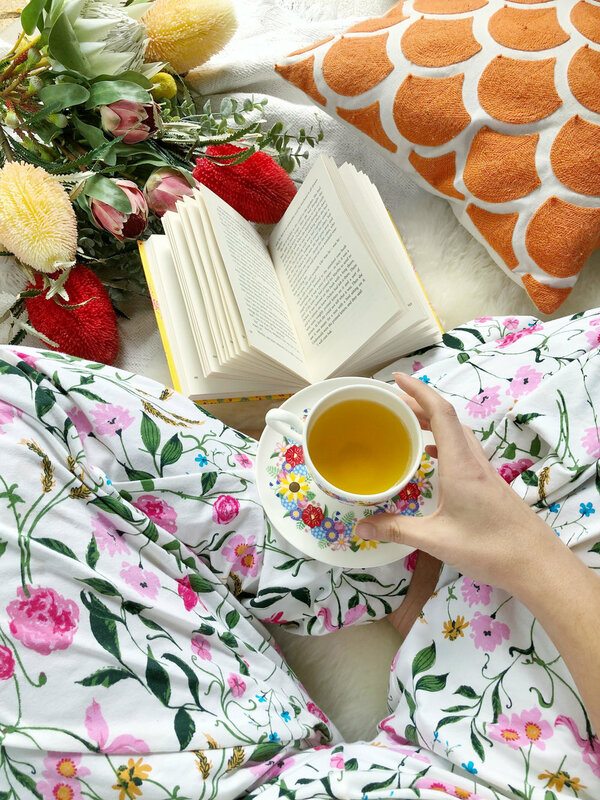 Curling up at the end of the day with my novel, my heat bag and a cup of tea is a way for me to force my brain to switch off and escape into another little world. I also make time most days for exercise and make sure to spend quality time with my special people. This is literally the most important thing ever and I think a lot of people tend to push this to the side. Balance is everything and without you’re just going to crash and burn honey. Q: Do you have any words you’d like to share with our fellow launch gals who are wanting more freedom and positivity in their lives, but might be struggling in their current journey? A: Just reach for the flippin stars. If I can do it, so can you! Nothing is going to be amazing right away. It takes courage, patience, perseverance, a whole lotta’ faith and just a little piece of your soul. And please remember that nothing happens overnight and that your success is your own. I believe in you, so you should to. Just for a bit of fun! A: Absolutely doubt myself but give it a go anyways. A: Always, ALWAYS do your best to be kind to others. A: At the moment I think it has to be Cardi B hahaha. She is absolutely fearless and I love her rawness and honesty. She has defied the odds and is such a powerful role model for so many different types of women. A: Anything that doesn’t make my taste buds recoil in distaste. So generally a nice cocktail haha. A: This might sound bad, but kinda nothing outstanding so far. I think I just take small lessons from everything I read :). A: Basically every beautiful thought that Van Gogh had. One of my favourites quotes by him is ‘I know nothing with any certainty, but the sight of the stars makes me dream’. GET YOUR TICKETS TO OUR NEXT LAUNCH GAL EVENT!